Cummin Clancy ( (9 November 1922 – 15 February 2013) who threw the discus for Ireland at the 1948 Olympic Games in London has died, aged 90. Cummin Clancy, then aged 26, from Ougherterard in Co Galway was a well-established athlete locally by the time the London Games came around. 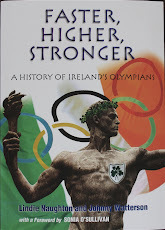 Clancy's talent as a discus thrower was discovered by former Irish discus champion Ned Tobin. After moving to Dublin and joining the Garda Síochána, Clancy joined the Donore Harriers club and was soon to become Irish champion and record holder. In 1948 he was again Irish champion and, two weeks before the Olympic Games, he added the British AAA championships to his list of wins. But although he was the best in these islands and world ranked fourth or fifth in the world he didn't come close to a medal in London. In Wembley Stadium, Clancy’s best throw in the qualifying round was only 40.73 metres, almost four metres short of the distance he needed to make the final. Yet on that trip to London, his life would change forever. He and 400m runner Jimmy Reardon were approached by the legendary American track coach Jumbo Elliott and offered a scholarship at Villanova University. The following year Clancy followed Reardon's footsteps and enrolled at Villanova continuing an association between the university and Ireland that was to encompass such great athletes as Ronnie Delany, Eamonn Coghlan and Sonia O'Sullivan. In 1952, Clancy improved his Irish record to 49.35m but he was never again to compete at the Olympics. Villanova was located next door to Rosemont College, then a women-only university, where young Maureen O’Grady, the daughter of Irish immigrants, was studying. The pair married and after graduating, Clancy remained in the USA working first for General Motors and then moving to New York and founding a successful insurance brokerage company. In 1967, they built a house in Glann, Oughterard, returning almost every year with their growing family.